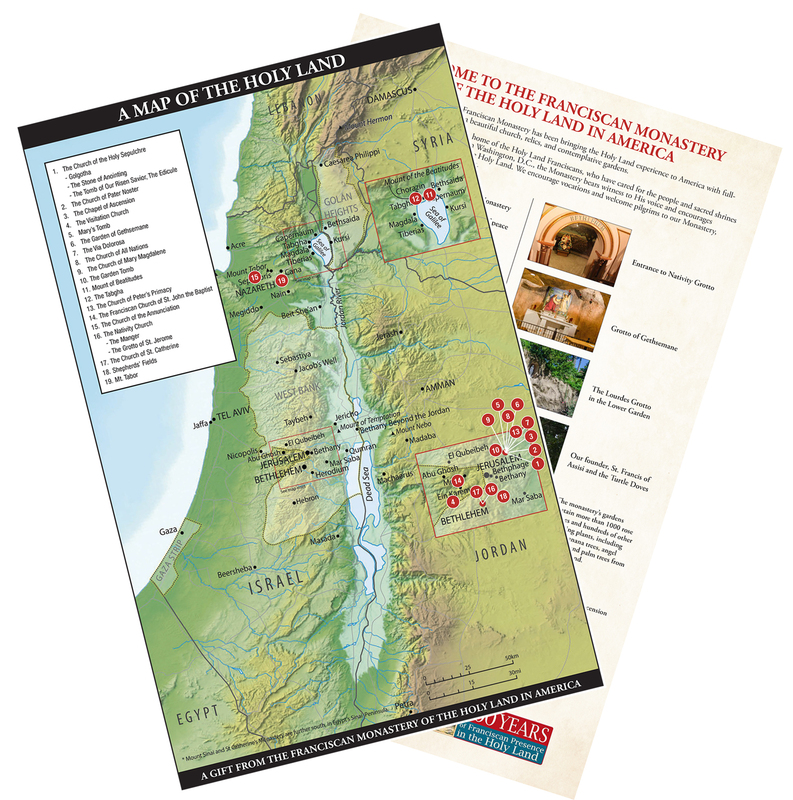 I want to send you this map of the Holy Land as a special gift. All you need to do is fill out the contact form with your name and address, and I’ll rush this beautiful keepsake to you right away— at no cost to you. This map gives you a glimpse of the holy places touched by Our Lord and the Apostles, and how the Franciscan Monastery of the Holy Land in America is bringing that life-changing Holy Land experience to thousands of pilgrims here in the U.S.
On one side, you’ll see the location of the holy places my brother Friars are guarding in the Holy Land. And on the other side are pictures of the replica shrines and sacred relics awaiting pilgrims like you at the Franciscan Monastery of the Holy Land in America. You’ve surely heard about the struggles Christians face in the Holy Land, but there is also so much beauty there, so many holy places that draw us closer to Our Lord. ... all these places tell us important stories about our faith and the life and teachings of the Word made flesh. We Friars labor to preserve these inspirational treasures. All we have at the Monastery — and all we do — is in service to God to foster greater devotion and prayer to Him. And prayer is at the heart of our holy work. We offer constant prayer for our faithful friends, for our nation, for our fellow Friars, and for the needy and suffering Christians they serve both here and in the Holy Land. I want you to have this map as a reminder of the importance of our daily prayers for the preservation of these holy sites and the spiritual well-being of Christians in the Holy Land. Please accept my offer and accept your free Holy Land map today. May God bestow the kindness of His grace upon you. And may you continue to be a living sign of His presence among us. Please enter your full address in the form below and we will send you our complimentary map of the Holy Land.